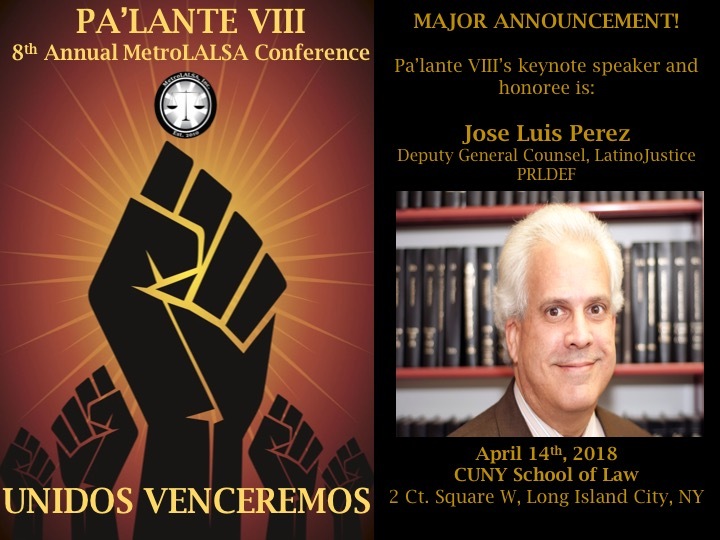 New York, NY – Jose Luis Perez, LatinoJustice PRLDEF’s Deputy General Counsel, will be the keynote speaker at MetroLALSA’s 8th annual Pa’lante Conference. Mr. Perez will address this year’s theme “Unidos Venceremos.” He will share his personal and professional experiences and will discuss current issues affecting the Latino community with a special focus on the crisis in Puerto Rico in the aftermath of Hurricane Maria. This year’s Conference theme encourages Latinos in the legal profession to unite to overcome these types of challenges so that together we can be a force for change in our communities. From his commitment to public service for the past 33 years, especially as the lead lawyer in a number of ground-breaking immigrants’ rights cases, Mr. Perez inspires many Latinos in the legal profession. He has served as Legal Director of LatinoJustice PRLDEF for the past decade. In that capacity, he works closely with LatinoJustice’s Communications & Community Engagement and Education Divisions on the organization’s many innovative pre-law pipeline and leadership programs. He has mentored countless high school, college, and law students and new lawyers of color over the years. Mr. Perez is a 1985 graduate of St. John’s University School of Law. He began his legal career as a prosecutor with the Queens County District Attorney’s Office and the NYC Housing Authority’s Anti-Narcotics Strike Force. He also worked at the NYC Legal Aid Society for over ten years, starting as a staff attorney in the Juvenile Rights Division and later serving as a supervising attorney in LAS’ Civil Division Brooklyn and Harlem Neighborhood Offices, overseeing the housing and family law practices. He also spent a year at Hofstra Law School supervising student attorneys in the Housing Rights and Disabilities Law Clinics while teaching lawyering and litigation skills. Prior to joining LatinoJustice, Jose served as an Assistant Attorney General, Deputy Chief, and Acting Chief of the NYS Attorney General’s Consumer Frauds & Protection Bureau. Additional speakers will be announced in the coming weeks including the honoree of this year’s Liderazgo Award. In years prior, attendees have benefited from the talent and wisdom of similar trailblazers such as the National Latino Outreach strategist for Senator Bernie Sanders’ 2016 presidential campaign Cesar Vargas, Esq. ; Deputy Secretary of Labor for the Office of the Governor, Andrew M. Cuomo, Elizabeth de Leon Bhargava; Steptoe & Johnson LLP Partner and 2008-2012 Governor of Puerto Rico Luis Fortuño; Presiding Justice of the New York Appellate Division of the Supreme Court, First Judicial Department, the Honorable Rolando T. Acosta; New York State Court of Appeals Judge the Honorable Jenny Rivera; and many more. Registration is now open for the Pa’lante VIII Conference, which will be hosted at CUNY School of Law on Saturday, April, 14th, 2018. MetroLALSA's mission is to empower and unify the Latina/o legal community, and the Pa'lante Conference is the central forum to achieving that mission. The conference caters to aspiring law students, current law students, attorneys and other legal professionals, who come together for a full day of networking and professional development opportunities, especially during the Organization Fair. In addition to our Keynote speaker, we are also honored to have many influential and key individuals join us for the panel discussions. The panel discussions will provide legal professionals with the opportunity to earn between 1.5 to 4 CLE credits. At the conference, we will also be awarding our annual Pa’lante Scholarship to a deserving law student. Our pipeline program will be integrated with the conference, giving students and professionals interested in pursuing law school an opportunity to speak with law students, legal professionals, law school admission officers, and, most importantly, an opportunity to participate in a mock-1L class. An early bird rate of $70.00 for attorneys, $25.00 for law students, $15.00 for pre-law students and $35.00 for community members, is available until further notice. To register for the 8th Annual Pa’lante Conference please visit bit.ly/Palante8. To learn more about the conference or our organization, please visit our website, like our Facebook page at https://www.facebook.com/metrolalsa/ or follow us on Instagram @metrolalsa. If you have any questions regarding the conference, including registration, please contact Blosmeli Leon-Depass, Conference Chair, at blosmeli.leon-depass@live.law.cuny.edu. On Wednesday, November 4, 2015 and Saturday, November 7, 2015, MetroLALSA joined other prominent and respected Latino organizations, including League of United Latin American Citizens (“LULAC”), National Hispanic Leadership Agenda (“NHLA”), and National Institute for Latino Policy (“NiLP”), in a protest in front of 30 Rockefeller Center to urge Saturday Night Live (“SNL”) to disinvite Donald Trump from hosting the American late-night comedy show. Trump’s racist remarks on the campaign trail have characterized Latinos and immigrants as rapists, drug dealers, and murderers, which have contributed to real occurrences of violence against Latinos throughout the nation. Chrystina Lopera, President of MetroLALSA, was interviewed by news reporters at the rally, and asserted that Donald Trump hosting SNL was egregious. In part she stated, "I don't think it's funny at all. SNL is a platform to poke fun of a lot things that are going on especially during election but if [Donald Trump] was on the street [making those statements], people would have a serious problem with that." In addition, Luis R. Rodriguez, MetroLALSA VP of Social Action stated, "The statements made by Donald Trump are hateful, bigoted speech and his degrading comments about the Latino community have no place on an iconic American television show." During the rally some of the chants included, "Hey hey, ho ho, Donald Trump has got to go" as well as "El racismo y el odio no es chiste!" and many others. On Saturday, November 7, 2015, when SNL aired, the Weekend Updates segment of SNL captured MetroLALSA VP of Social Action, Luis Rodriguez, on its show. To support the movement against media networks providing Donald Trump a national platform for his hateful speech, please use the hashtags, #RacismIsntFunny, #StopTheHate, #BoycottSNL to spread news on social media forums. MetroLALSA, Inc. is comprised of Latina/o law students and law graduates from thirteen law schools in New York and New Jersey, and was founded with the principal aim to provide a platform for the Latina/o law community to speak and act on pertinent issues affecting Latina/os in the law.